As an artist, getting your hands on the best possible sketchbook that you can find can make or break your art. Depending on the type of media that you’re using, you want to ensure you look at critical features such as texture and paper weight to ensure you’re getting what you need. We’ve compiled a list of five sketchbooks to determine which is the best sketchbook for your needs, so the next time you go to purchase one, you know exactly what to look for. We’ve also included a helpful buyer’s guide and answered some probing questions to help you further. How to Choose a Sketchbook? How to Use a Sketchbook? What to Draw in a Sketchbook? How to Keep a Sketchbook? Strathmore is one of the most well-known names in the world of art supplies and has been around for decades. It only made sense that we include one of their top-rated sketchbooks to see how it really compares with the others. We chose the 12-Inch Spiral Sketchbook because of how universal it is and how highly recommended the product is for beginning artists. 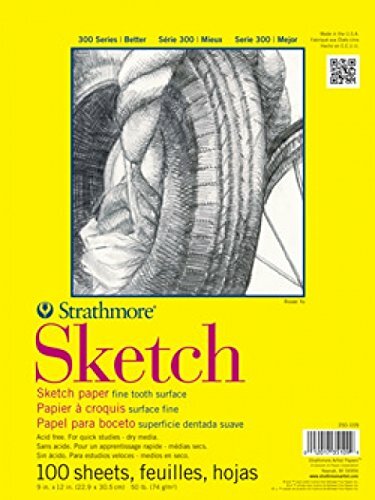 The Strathmore Spiral Sketchbook is a great pad that’s designed for beginner and student artists who are looking to practice their technique. The paper has a weight of 50 pounds and is lightly textured. 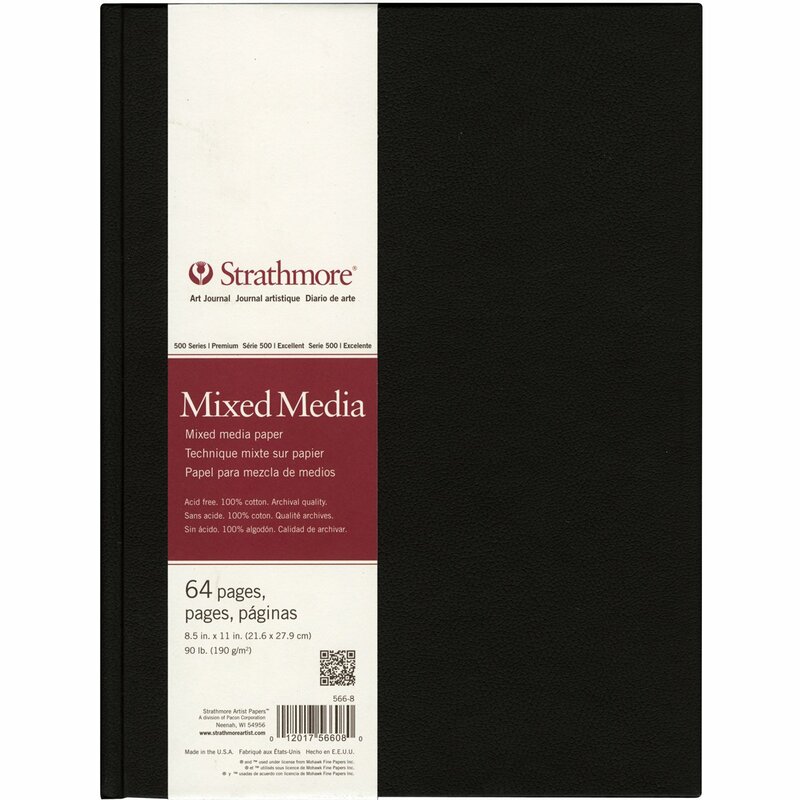 It includes 100 sheets of blank pages that can be used with the majority of dry media such as charcoal, pencils, and pencil crayons. One of the key selling points of this sketchbook outside of the affordability is the number of blank pages that it comes with. 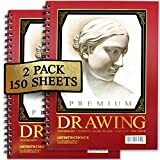 It makes it the ideal option for students looking to purchase a sketchbook for their art class, or beginners looking to practice their techniques with a variety of media. Additionally, the spiral bound includes micro-perforated sheets that make it easy to tear out pages, while the acid-free paper ensures your art lasts. With the Strathmore Sketchbook, we found that the binding would have been better if it was at the side of the sketchbook instead of at the top. Also, we did notice some bleed through when using markers on the pages and didn’t believe that it would be a suitable option for anyone looking to travel with their sketchbook. Moving on to the second sketchbook in our comparison, we tested out the Bienfang Sketchbook. We wanted to see for ourselves how the Amazon Choice product held up against some of the others to ensure that you’re getting your money’s worth when making your investment. Like the Strathmore, the Bienfang Sketchbook is perfect for beginners, so let’s take a look at what else we uncovered. 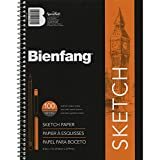 The Bienfang Sketchbook is a top-rated sketchbook that’s put together with a spiral binding, front and back cover, and 100 sheets of paper at a 50lbs weight. 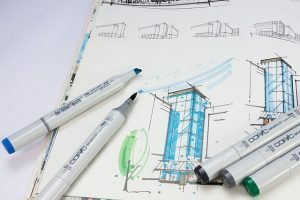 The sketchbook is recommended to be used with media such as pen and pencil, and is perfect for artists, illustrators, and writers looking to test out different techniques. Also, these pages are acid-free, which helps to ensure the longevity of your art. With this sketchbook, we found that the pages came with the right amount of tooth. The paper wasn’t too smooth like regular paper, but it was nowhere near rough enough not to be used with dry media like wax crayons and pencil crayons. The extreme affordability of this sketchbook was another key point for us, and we liked that we were able to travel around with it. When working with beginner sketchbooks, it’s only understandable to realize that the product is going to lack in specific areas. We did find that the covers on this sketchbook were susceptible to tearing and depending on how heavy our media was, there was some bleeding through. If you use this sketchbook, it’s recommended that you only use one side of the page, especially when using a specific type of marker. Also, the sheets didn’t seem to be micro-perforated, which made it difficult to tear the paper out of the book when we wanted to. Moving our way through the list, we brought the Pentalic Traditional Hardbound Sketchbook in as the third book on our list. As another Amazon Choice by a brand that has a fantastic and continuously growing reputation, leaving it out would have felt like a crime. Let’s take a look at the highlights and features that make this hardbound sketchbook worth the purchase. Pentalic brought new meaning to classic sketchbook with their upgrade on the traditional model. The hardcover has an embossed leather texture while the hardbound design keeps artworks and pages in place for minimal sliding. It’s also designed to lay flat, so you won’t need to fight against pages that want to close. Additionally, the sketchbook includes 220 pages of heavyweight, 70lbs, acid-free paper that keeps the colors of your projects vibrant. Primarily, the design of the Pentalic Sketchbook is what caught our eye first since it’s incredibly aesthetically pleasing. The leatherette cover makes it look far more expensive than it actually is, and the paper has a nice feel to it and is smooth with a bit of a tooth. We also really liked the heavyweight paper and didn’t notice any bleeding through with the media that we used, making all pages usable, instead of just one side. The pages of the Pentalic Sketchbook don’t need to be perforated because it’s hardbound, so tearing them out should be clean and precise, but we noticed some occasional challenges. We also found that depending on where in the sketchbook we were, the pages tried to close on us, and the sketchbook doesn’t include any folders or straps to keep the book shut and opened when this happens. Moving on to the Canson Artist Series Sketchbook, we had high hopes for it. The Canson book is one of the highest rated that we could find, and the price point mixed with the consumer reviews alone was enough of a reason to put this on our list. How did it compare to some of the other well-known names? Keep reading to find out more about the Canson Artist Series. The Canson Artist Series Sketch Pad was designed with multiple types of artists and numerous forms of dry media in mind. The paper is heavyweight at 65lbs and has a nice texture with a decent tooth that helps with smudging and erasing. The sketchpad is spiralbound but has 100 micro-perforated sheets for easy removal, and the pages are also acid-free to assist with the longevity of your artwork. 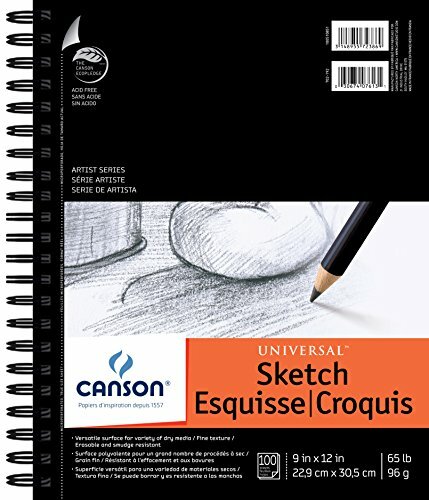 There are many things to be liked about the Canon Artist Series Sketchpad. The size makes it ideal for travel, and the quality of the paper makes it a sketchbook that’s perfect for both student, beginner, advanced, and professional artists. You can also use it for journaling and writing. The sketchbook also works with various types of media such as pencil, pen, marker, and watercolor, and it seems to hold up quite well. We also couldn’t complain about the price point. While the page quality in the Canson Artist Sketchpad is quite good, there were strong and noticeable issues with the front and back cover of the notebook. While by definition it is a hardcover sketchbook, we found it to be quite flimsy and noticed that it would tear easily when traveling around with it. There was also a small amount of bleeding when using markers such as Sharpies. We’ve come to our last sketchbook on our guide to helping you find the best one of 2017. Artist’s Choice has been around for a long time, have an excellent reputation, and is another highly rated sketchbook that made it the perfect fit for the fifth and final comparison of our view. Did it beat out all the others? Let’s find out. Artist’s Choice have gone out of their way to ensure that consumers receive exactly what they pay for. The package includes 150 pages of high quality, 60lbs paper that has a neutral pH, non-reflective finish, and is entirely acid-free. While the sketchpad is universally used between novice and experienced artists, it’s also suitable for writers, and illustrators. Additionally, Artist’s Choice provides a complete manufacturer’s money back guarantee. As a consumer, it’s always a benefit to see companies that go out of their way to ensure the customer experience is a good one, and that’s what Artist’s Choice does. Their buy one, get one offer provides 50% more than most competitors, and the money back guarantee is a significant benefit. The perforated sheets are a wonderful addition that makes it easy to tear out the pages of the sketchbook when needed. There wasn’t much that we didn’t like when using Artist’s Choice’s sketchbook, but we did find that there were a few pages that seemed to be lined up inappropriately. Also, depending on the type of media you are using, you should test out any felt tip pens or markers before sketching anything heavy to ensure there isn’t any ghosting or bleeding through. Understanding what to look for in a sketchbook is what’s going to ensure that you purchase one that matches your specific needs. If you’re new to the world of sketchbooks, there’s a good chance that you might get confused, especially when it comes to understanding paper weight and the types of panels and orientations that are available. Thus, we’ve created this buyer’s guide to help make the process just that much easier for you. The sizing of your sketchbook is critical because the measurement displayed pertains to the size of the paper inside. You’re not going to have the best sketchbook for your needs if you don’t have the right size. A4 is the most universally used paper size in the world. It is equal to 8.27 x 11.69 inches. A3 is commonly used in professional and family environments and has a dimension of 16.54 x 11.69 inches. A2 size is the third largest of the A sizing and has 16.54 x 23.39 inches of a size. When selecting the binding of your sketchbook, it’s going to mostly be a matter of preference. If you tend to do a lot of journaling in your sketchbook, you might find that the spirals get in the way. Spiralbound sketchbooks are very popular because they do tend to lay flatter and you can purchase them with micro-perforations to make the pages easier to tear out. On the other hand, hardbound sketchbooks are typically safer, more durable, and you don’t risk the wire snagging on anything if you’re carrying it in a bag or a backpack. Similar to the binding on your sketchbook, the cover is going to be a matter of personal preference, though it’s best to understand where you are taking it. Typically, hardcover sketchbooks are more durable and are going to protect the pages inside of the notebook better. 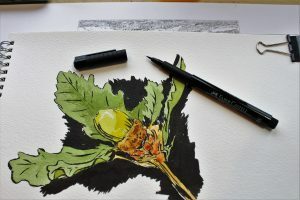 If you won’t be finding yourself in situations where the sketchbook could get damaged, or you do most of your sketching from the comfort of your home, a softcover sketchbook would work just as well. The majority of sketchbooks come in either portrait or landscape orientation, but you can occasionally find that some come in a square format. It is a personal choice, but with purchasing a landscape format, you can sketch or paint horizontal sceneries without needing to go across the gutter. You can purchase sketchbooks that come with a variety of paper, and this is where things can start to get confusing if you’re a beginner. 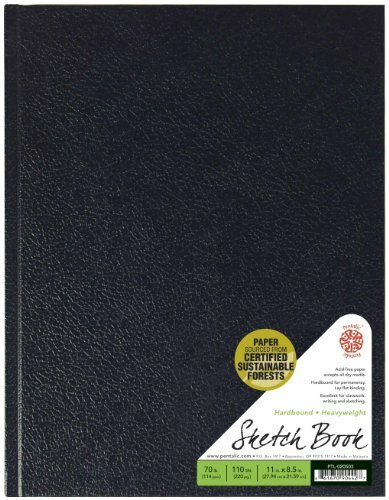 Usually, sketchbooks come in standard paper, cartridge paper, watercolor, toned, or black paper. 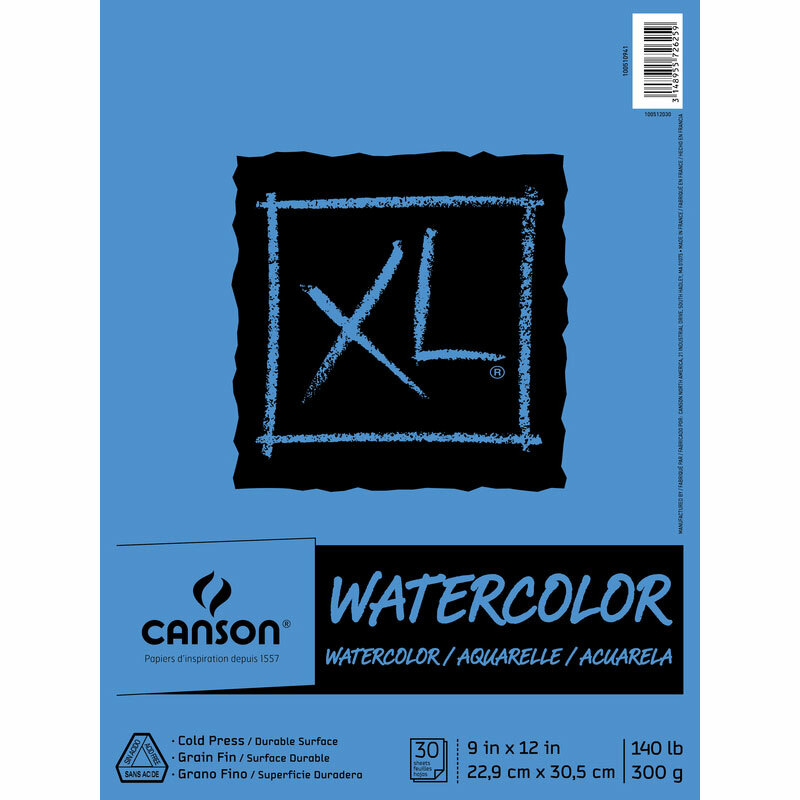 Cartridge paper has high quality and is commonly used by illustrators, whereas artists who paint with watercolor typically use watercolor paper. The paper is cotton content, cold-pressed, and explicitly designed to be able to absorb the water that comes off of the paint. The paper found in your sketchbook can also have different textures, depending on the media that they are suited for. Some paper might feel like linen, and others may feel like your standard paper. Hotpress is the term used for smooth paper, cold-press is lightly textured, and then there is rough. It’s recommended that you avoid using pencil crayons, pencils, crayons, and even soft charcoal on rough paper as it wears down your media quickly. 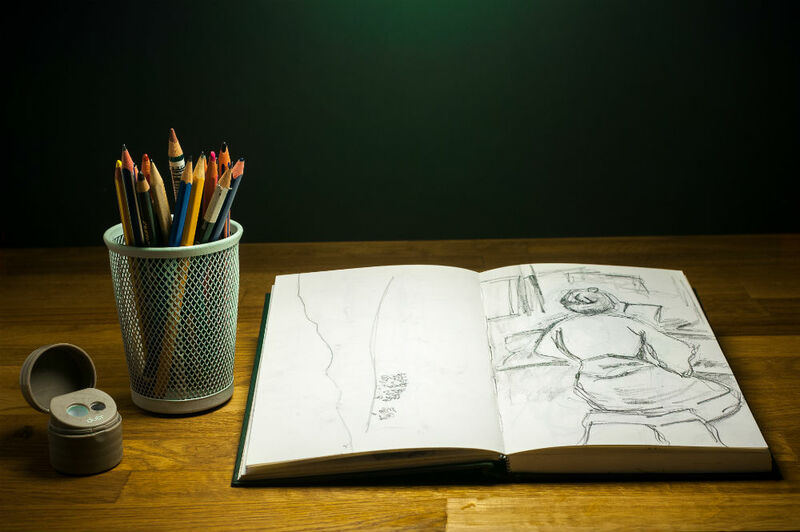 How to choose a sketchbook is one of the most commonly asked questions, and if you’re a beginner, it could be something that you struggle with. Ideally, the first thing that you need is to understand the type of media that you’re going to use. For instance, if you are going to paint with watercolors, you should look for a sketchbook that has cold-pressed, heavyweight paper to ensure you’re getting something that can absorb the water. 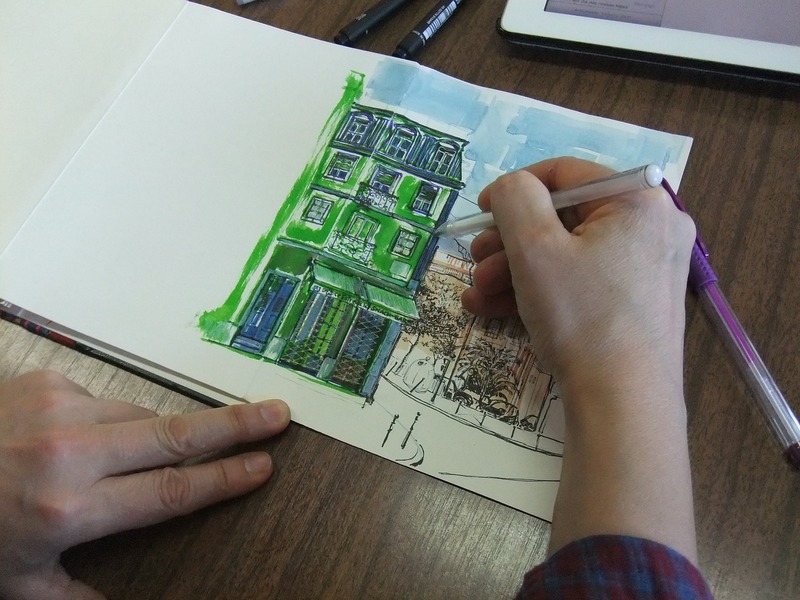 The type of media that you’re using plays a significant role in your sketchbook. The heavier the weight, the more durable and sturdy the paper is. It’s also a good idea to look at sketchbooks that have acid-free paper, so you know your artwork is going to last, especially if you’re using colors. Typically, charcoal and pencil media work fine regardless of the paper that’s being used. Consider trying multiple techniques on your sketchbook so you can determine what’s best for you. The great thing about having a sketchbook is there are no definitive rules that you need to follow to use it. To make things easier, we’ve come up with a few tips that you can follow along with. First and foremost, you need to get your sketchbook. Once you have it, ensure that you put your contact information inside of it, so it can get returned to you should you lose it. You can also decorate your new sketchbook with stickers and anything else you’d like so it’s customized to fit your personality. The most important part of using a sketchbook, however, is actually using it. Make sure that you bring it with you everywhere because you never know where inspiration is going to strike. 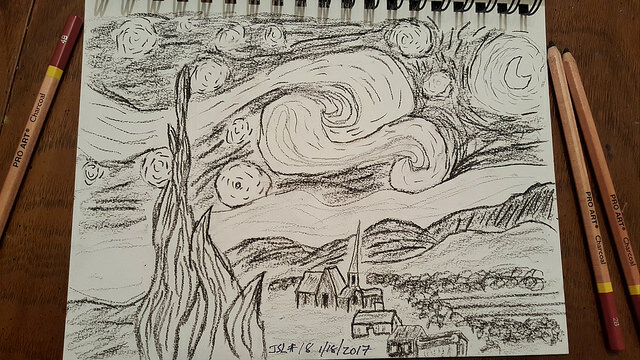 If you can’t think of what to draw or paint, just start doodling. Sometimes all it takes is moving around your pencil for ideas to pop into your mind. The internet is full of resources that are available to you if you’re struggling to come up with ideas on what to fill your sketchbook with. There are drawing challenges, lists of ideas, and more, which you can find just with a simple search. 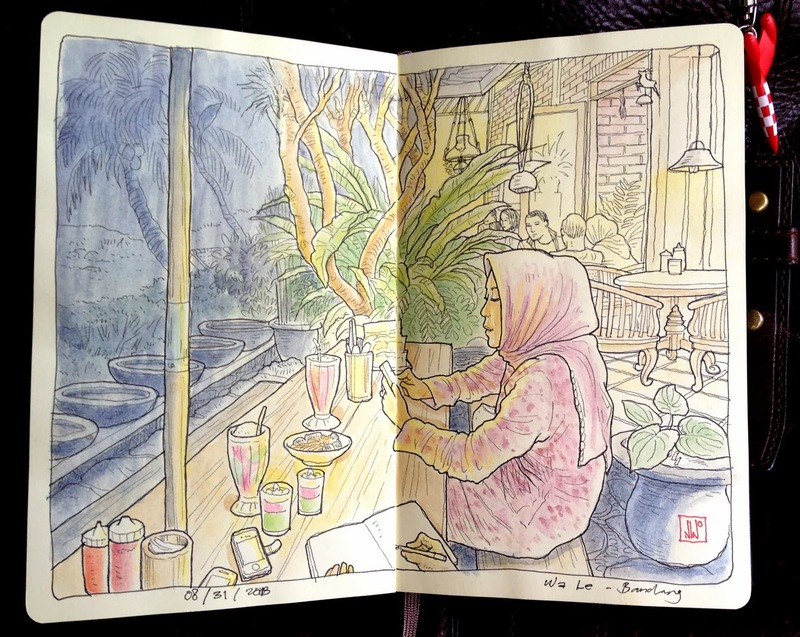 Your sketchbook belongs to you, and you can fill it with anything that you see fit. If you’re a beginner, you can try drawing inanimate objects, furniture, fruits, etc. 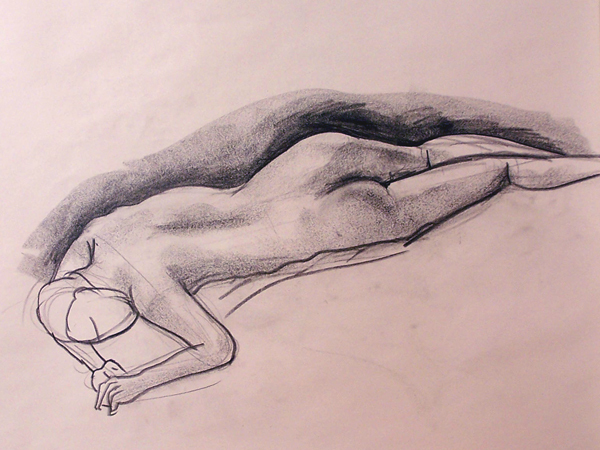 If you’re more advanced, you can sketch portraits, landscapes, and anything else that comes to mind. There doesn’t need to be a method to how you draw on your sketchbook pages; you just need to pick up a pencil and start drawing. Sketchbooks are relatively easy to understand, even though they come in a variety of sizes with various paper weights. Simply put, sketchbooks are pads or journals of blank pages that are used by writers and artists as a way to document or commemorate their creative process. 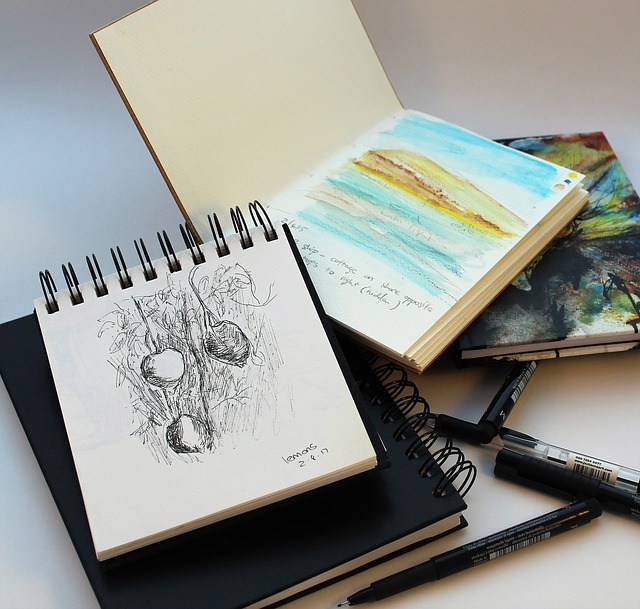 Sketchbooks are also used as a way for artists to test out different techniques with various media such as pencil versus charcoal. Using your sketchbook can be a lot of fun, and the possibilities that you have with it are nearly endless. Don’t spend too much time worrying about how you’re going to start, and just put your pencil on the paper and start drawing. As you go, the process gets easier. You can start mixing different media such as acrylics, watercolors, pencil crayons, markers, and more. Ensure that you bring your sketchbook with you everywhere, so you always have an outlet to unleash your creativity on. Also, it’s a good idea not to spend too much time worrying about warped pages. Depending on the media that you use and the paper's weight, your sheets could wrinkle. You might think that picking the best of the best would be easy when it comes to sketchbooks, but it wasn’t. When determining the best choice, we looked at factors such as the way the sketchbook was designed, how the pages tear out, as well if it’s easy to travel with it, if it can be used with various types of media, and of course, paper quality. 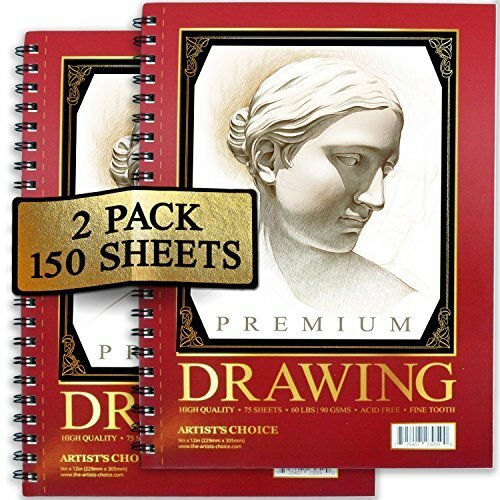 After looking at all of those features, we concluded that the Artist’s Choice Two-Pack Sketch Pad is the way to go. As previously mentioned, Artist’s Choice works diligently to provide their customers with a quality product that’s backed by a money-back guarantee. 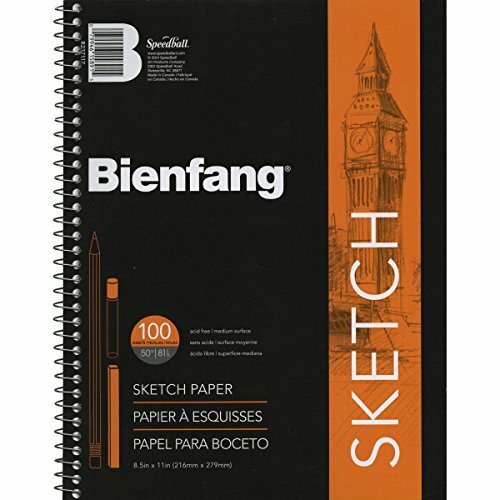 In addition to that, the sketchbooks can be used by artists, writers, and illustrators regardless of skillset, and the pads have a great spiraled binding with perforated sheets. 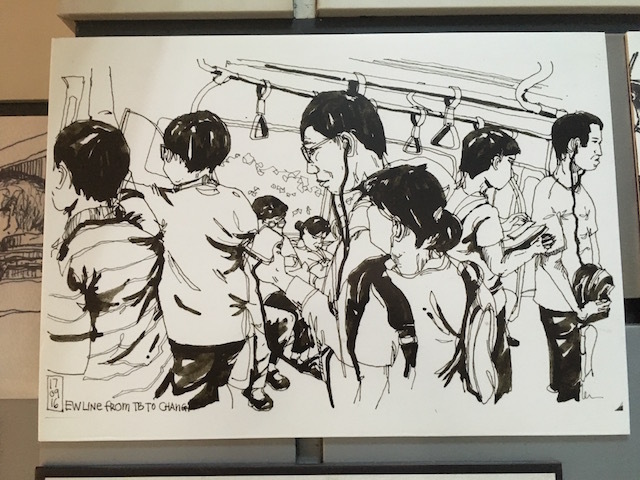 So, if you’re looking for a great sketchbook that you can travel with and get your money’s worth, look into purchasing the Artist’s Choice Sketch Pad. There’s a reason the brand is as popular as it is. Don't forget to also read our article on the Best Watercolor Sketchbooks of 2019: Complete Reviews with Comparison.